Change is inevitable. Any successful business manager knows their organization must continually evolve to stay relevant and competitive. Whether it’s the packaged goods company that has reached the limits of its market, or the financial giant integrating a new software platform, or the global corporation building teams, adaptability is imperative. Having resilient employees that are open to change and better equipped to cope with stress is key. But it may surprise you to learn who among your employees will weather the storm and who won’t. The Chief Technology Officer? Or the lead on the innovation project? Your top analyst? While some managers understandably assume that their highest earning, most highly educated employees are all highly resilient, they may need to think again. A study from meQuilibrium, the only clinically validated resilience building program on the market today, conducted by behavioral scientist Wendy Lynch, Ph.D., and psychologist Andrew Shatté, Ph.D., shows that a large salary and a college degree do not guarantee high resilience. In fact, resilience, defined as the ability to bounce back from adversity, is independent of income and education, as well as other personal attributes, including age and gender. And nearly half of the people surveyed in the study who had high levels of education and income scored low in resilience. These findings mean that your highest paid, highest educated employees are at risk for feeling burned out, having sleep issues, experiencing more absences, and slowing down their productivity. What’s more, study participants with low resilience scores had three times the depression risk and twice the rate of absence and intent to quit than those who scored high in resilience. You have just a 50/50 chance of guessing who those people are, according to the study. 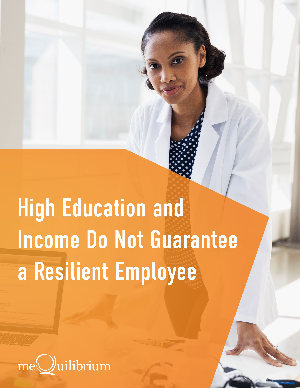 “If an employer is interested in resilience, they can’t ignore their highly paid and highly educated workers,” said Lynch, the study’s primary author.